The fires a few years ago in the Crowsnest Pass proved that fires do wonders for backcounty skiing. For sure the area will be safe to enter months down the road after there is a good blanket of snow in there, but what are the general guidelines for re-entering a forest that has recently been burned out by forest fire? A municipal leader in British Columbia's central Interior says he wouldn't be surprised if wildfires that have chewed through more than 10,600 square kilometres of woodland smoulder until 2018. Chairman Al Richmond of the Cariboo Regional District said hot spots from many of the largest fires likely won't be doused until the spring, mirroring the Fort McMurray wildfire. Burned trees may pose a hazard in three ways. Fire does not just burn above ground; stumps and root systems are also consumed leaving holes and hollow areas below the ground. A person can easily stumble into these holes or have the earth give way above a burned-out root system. Immediately following a fire, these pockets may still be hot and pose a burn risk. The fire may have consumed a significant portion of a tree’s root system or lower trunk, although the tree is frequently left standing. These trees may fall at any time, even without wind. Fallen trees may get hung up in the branches of other trees and break away at a later time. Upper portions of the trunk and branches may have been partially consumed in the fire, yet still retain a fragile connection to the tree. Again, these may break away from the main tree without warning. Wind will exacerbate the problem. 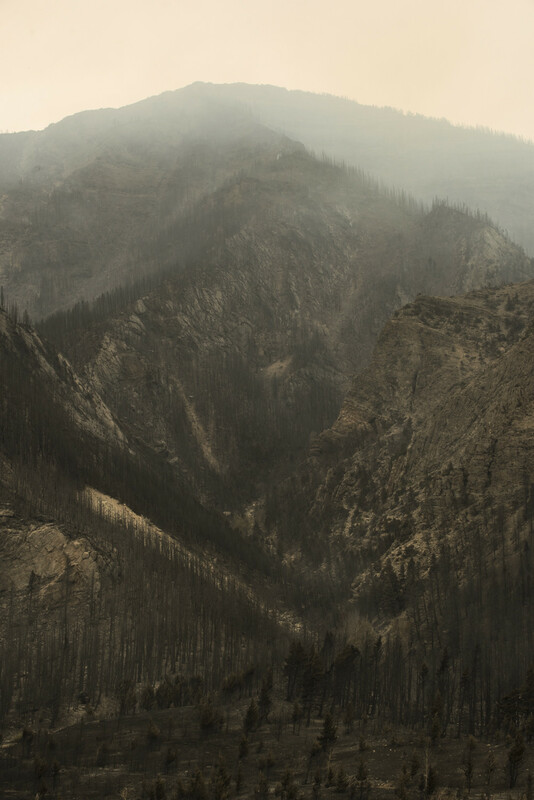 For how long it would take to have all of the fire burned trees fall, it could take decades. However, the risk should lessen as time goes on. I'd like to caution against returning to recently burned areas for recreational purposes. Give it a year or two for vegetation to return. Traveling, even by foot, could cause irreparable damage when the rainy season comes. Even without your help, the root structure is severely weakened. Paths made on hillsides can quickly become water channels that promote erosion and slow the healing of damaged land. Now that parts of the Park have been reopened, I've learned that there are several answers to this question. In the case of "when is it safe", the answer is essentially, "when the fire is out". There will still be hazards however: There may be hot spots, or hot coals smoldering underground. Falling trees and rock slides are a hazard, as the fire will also burn the top layer of hummus, which make the ground vulnerable to erosion. In the case of a National park, there are other considerations other than the safety of people entering the park. As the natural growth recovers, the soil is vulnerable to invasive species. Patrons entering the park with dirty boots could introduce an invasive plant that could completely take over the whole park, so controlling the regrowth, and giving it an opportunity to do so uninterrupted is beneficial. There is at least one other reason the park officials have kept the park closed as long as they have as well: Archaeology. Burning off the top layer of soil apparently makes it much easier to find ancient Indian artifacts! Artifacts such as arrow heads and glass beads are being found all over the burnt areas of the park just laying on the ground. Archaeologists have been sifting through the ashes gathering up as many as they can find, and they have been able to identify hundreds of ancient camp sites. With training and while accompanied by experienced people, you can safely enter the burned area of a forest fire, while the fire is still burning. There is an entire career field dedicated to the practice it is called 'Wildland Firefighting' and in the US alone about 10,000 people are employed by the National Forest service Additionally there are multiple private firms that hire and train seasonal workers for the job. The vast majority of these people are on the ground, ahead and behind the fire line. I personally have been a Wildland Firefighter, and have entered multiple forests during a fire. The highest risk is not in the burned area, it is the area ahead of the fire, where all the dry fuel is. While there are some risks in the burned area, it is much safer than, the area full of dry fuel. As pointed out in the existing answers, the public is mostly prevented from entering the burned area to protect the area, not the people. Not the answer you're looking for? Browse other questions tagged forest-fires or ask your own question. How can I be absolutely sure my fire is safely extinguished?